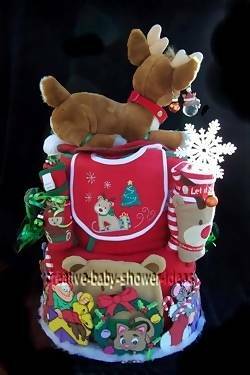 Looking for some great diaper cake ideas? We've got lots of them! 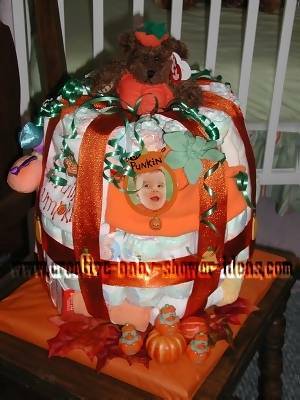 Search our photo gallery to get ideas on creating the perfect diaper cake to give as a baby shower gift. We would love to see your photos and tips! Share them with us here. 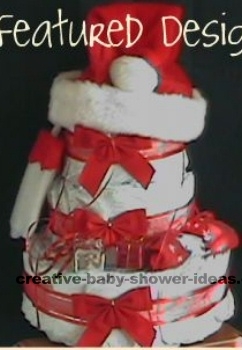 One of my dear friends is going to be a Grandma and she is having a baby shower for her oldest daughter. 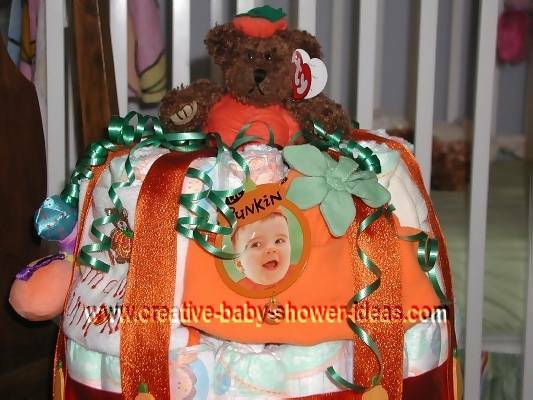 He will be born near Halloween, so I used your ideas and made a Harvest Diaper Cake. 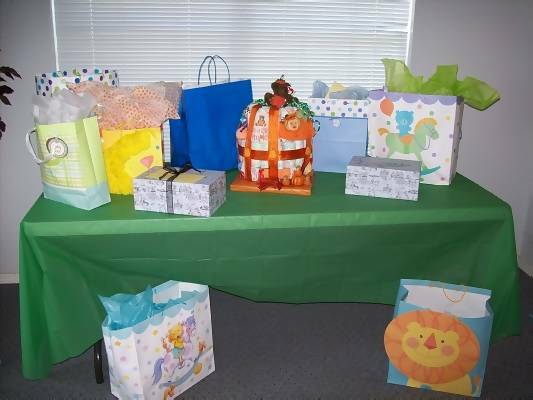 I hosted a Lil Pumpkin baby shower since she was due in October. It was a big hit! I used size 2 Huggies Supreme (entire bag of 80). I rolled each diaper and tied with green ribbon. It was assembled into 3 "layers" by tying them with wide orange ribbon. For the middle layer I tied it after each round of diapers to keep it tight so that it wouldn't 'fall'. To keep the layers together and make it look like a pumpkin I used more of the orange ribbon and went all the way around with 3 separate cuts of ribbon. I tucked the ends into the green ribbon on the diapers in the middle diapers to secure. 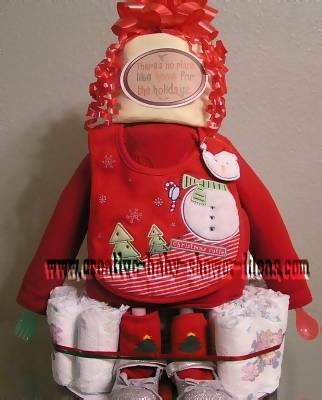 For the top layer I removed the middle diaper and put a "Ty Peter Attic Treasure" bear inside to peep out over the edge. Curled more green ribbon to make the stem and poked down under the bear. For my 'plate' I wrapped a 12X12 blank scrapbook album with orange tissue paper. I hot glued the pumpkins and rubber duckies near the front to decorate. I also hot glued some little wooden pumpkins at intervals around middle of pumpkin. I did not use tape or glue on any of the diapers. 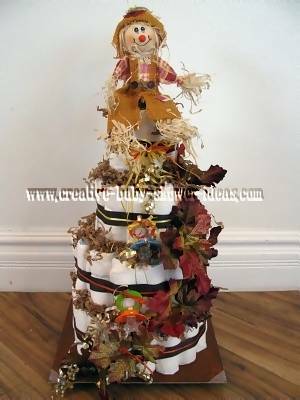 All that was left was to decorate with pumpkin themed baby items! The border is drawn by me personally. 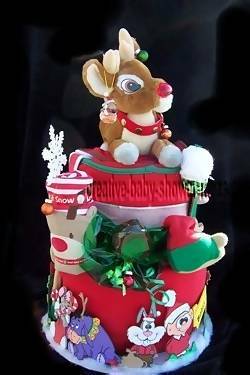 I had FUN with this Cake.... From finding Christmas€items and trying to keep everything Red and Green as much as possible. When I saw mini ketchup containers at our local restaurant I had a GREAT IDEA. I went and bought mini Christmas Cupcake wrappers and attached it to the bottom of the ketchup containers. Then I placed the Scratch mitts inside. VOILA Christmas Muffins. Who would have thought? 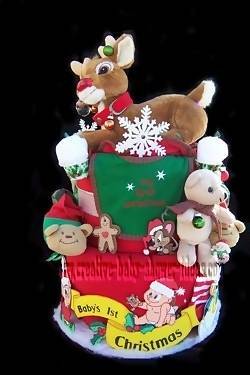 Hi there I just thought I would share this with you Babies First Christmas Diaper Cake. It was made by request for a friend who wanted an extra special gift for her first grandchild she loved it and I loved making it for her. 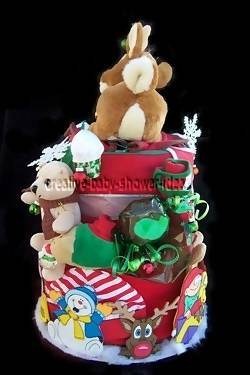 There are over 25 size 2 diapers, muslin cloths, clothing items and babies bottles inside the cake and a lovely Christmas teddy on top. Hope you like it. 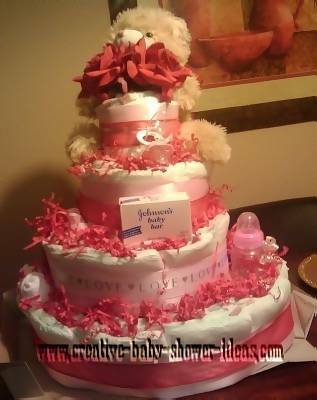 Using the baby shower theme "Valentine Baby", I created a beautiful diaper cake that had red and pink ribbon. 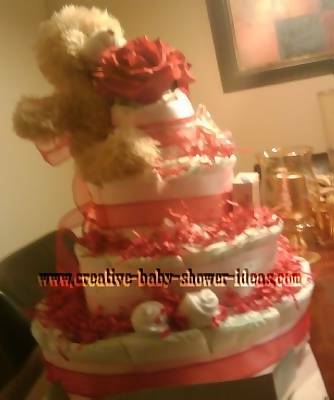 I used about 115 diapers for this 4 tier cake. Hidden inside is a can if baby formula. 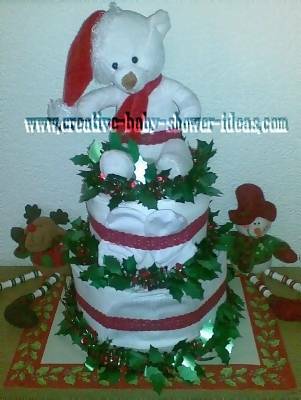 The cake also includes a teddy bear, 2 red silk roses, 2 pair of baby socks, a pacifier, bottle, 2 wash clothes and a bar of baby soap.